used stamps | Save stamps for charity - U.A.E. Here’s just one story from someone who was helped by the RNIB. Louie is 5 years old and is registered blind. Recently Louie’s mum Karen has introduced him to Talking Books, which he listens to a lot – especially just before bedtime and when he has to travel up to Great Ormond Street hospital, which he does every three months. I’m sending off the next batch of stamps next week. It’s a small contribution to helping the vital work of the RNIB but every bit helps. If you have any used postage stamps please get them to me asap. It’s recycling something that you’d throw away for a very good cause. Thank you to everyone who has taken the trouble to send me stamps. There is a big pile on my table ready to be parcelled up. If you were celebrating Christmas, I hope you had a good one. I received many less Christmas cards through the post this year and many more online ones. I suppose it might be my age but I like the excitement of (carefully) opening the envelope and seeing a personal message. 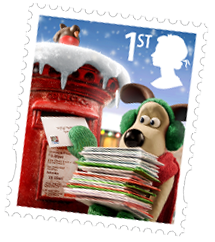 Many of my cards came from the UK and this year’s Christmas stamps featured the characters of Wallace and Gromit, plasticine figures made by Nick Park. I listened to his choices on Desert Island Discs the other day and he sounded absolutely thrilled that his creations were on the stamps. I know that volunteer Terri who works tirelessly collecting the stamps for the RNIB in the UK is also thrilled whenever we send a parcel from the UAE. She sees first hand the excellent work to help people who are blind that these funds help enable. I aim to send a nice package by the end of January so please get your stamps to me soon (direct to me, via Gulf for Good or Volunteer in Abu Dhabi). Thank you for all your contributions large or small and Happy New Year.